You’ve made your list and checked it twice. Aunt Joan is getting slippers, and your brother is getting golf gloves. But the spot next to your sweetheart’s name remains blank. The pressure to find the perfect gift can be overwhelming, but if you tap into your sense of romance and ingenuity, you might find that you have just the thing to elicit a delighted kiss from your sweetie on Christmas morning. Here are some ideas that will help get your creative juices flowing. Customize Your Affection – Anita Thompson <www.anitajewelry.com> , who creates kiln-fired glass jewelry, suggests custom baubles for a tender gift idea. Paintings, pottery or other artisan designs can also be created with your partner’s taste in mind. Fulfill a Dream – How many times has he said that “someday” he’s going to own a hot Corvette convertible? Make him a king for a weekend and arrange to rent his dream car. Find a miniature model or ornament of it to wrap and tuck under the tree. When he opens it, explain that you plan to zoom away for a weekend of his choice in the wheels he’s always wanted. Avis and Hertz both offer Corvettes in limited cities, but some local, non-chain agencies provide this car, too. If a fancy sports car isn’t possible in your town, a limo stocked with a bottle of bubbly for a night on the town with you may be just the thing to make him smile. Enhance Knowledge – Expand your partner’s mind by giving the gift of education. Contact a Spanish tutor and purchase five lessons. Wrap the gift certificate with a beginning Spanish book and a coupon to a local Mexican restaurant. Or plan to learn together. Contact your local dance studio for a beginner’s package. In no time, your one moment of romance will blossom into many opportunities to hold each other close and relive the intimacy of the holidays. Geocasche Your Love – Give your sweetheart a treasure hunt in the form of a pocket GPS. Visit different points around town and program them into the unit. Purchase small gift cards at each place and tuck them into numbered envelopes that correspond with the numbered points in the GPS. Wrap them all together to slip under the tree. When your holiday honey successfully tracks down a point, he or she can open an envelope and be treated to another surprise. Craft Some Coupons – Pick up a package of colorful index cards at your local office supply store and get creative. Draw a picture of the fridge for a free kitchen cleaning, a picnic basket for a free “I’ll cook,” or a pair of feet to suggest a foot rub. Cut tabs across the bottom for six free “I’m sorrys” to really win your love over. Whatever your Christmas Cupid likes, make it into a coupon. Take Flight – Sweep your love off her feet in an airplane or a hot air balloon. Airports around the country are home to small companies that will happily participate in your Kris Kringle creativity by offering a flight of fancy for about $200. Look in your local phone book under “aircraft charter, rental or leasing” to find an airplane ride, or search under “balloons – hot air” to silently lift off under a brightly colored orb. Be Insightful – Show your Mr. or Mrs. Claus that you’ve been listening to those little desires all year. Notice that he’s wanted a new tool belt and give him one filled with the little tools he can’t ever find at his fingertips. Remember that she wished for a deviled-egg plate, water ski gloves or a massage at the local spa. Small things that are only mentioned one time in passing can seem very significant when wrapped and tucked under the tree. They show that you listened, cared and tried to find a sweet way to please. Toes at the Hotel Del Coronado in Coronado, Calif. 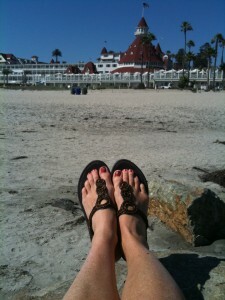 The thought of San Diego evokes images of sand castles, sailboats, surfboards, – and Christmas? Absolutely. While Southern Californians might not have snowmen and frosty sleigh rides, the holiday spirit is alive and well. Palm trees twinkle with lights, poinsettias bloom throughout the city and familiar carols are in the air. Multicultural and deeply rooted historic traditions lend richness to the holidays as they meld with contemporary celebrations into the quintessential San Diego Christmas season. Although the Kumeyaay people existed in the area we know as Southern California for 9000 years, the first people to celebrate Christmas in the San Diego area were Spanish explorers who founded the Mission San Diego de Alcala in 1769. This “Mother of Missions” changed the local customs and was the first of 21 missions that began the colonization of California. The mission remains active and invites guests to join in long-established religious holiday celebrations. By 1835, a village, El Pueblo de San Diego, had sprung up at the foot of the mission’s hill. Its adobe walls and Mexican population were the seed from which the current shining metropolis sprang forth, and the area is now known as San Diego’s Old Town. To enjoy the deeply traditional culture of San Diego, visit Christmas services at the original mission or have a lunch of tamales and margaritas on the patio of a Mexican restaurant where strolling mariachis sing in the season. In 1904, the Hotel del Coronado boasted the first American electrically lighted outdoor Christmas tree that brought the city into a new era. Now more than 60,000 lights sparkle on “The del’s” Winter Wonderland each night of the holidays, while “del elves” tuck in children after a day of cookie decorating, ice skating and holiday crafts. In the lobby is a two-story tree whose annually changing decorations bring the hotel to life. Light lunch on the terrace, a stroll on the beach and Victorian tea in the Palm Court mark a quintessential “SoCal” holiday experience and revive the glory days of the hotel. Edward, Prince of Wales, abdicated his throne in 1936 after falling in love with Wallis Simpson, a Coronado housewife who frequented The Del. Some say they met at a ball there in 1920, and their romance has brought glamour to the hotel. Today you, too, can enjoy this holiday paradise where elegant surroundings, spa delights, and oceanfront dining make ice and snow melt into a distant memory. Balboa Park comes brightly alive for the holidays with locally grown poinsettias. The largest in the city, the park is the home of museums, theaters, lush gardens and the famed San Diego Zoo. Many of the festively ornamented buildings owe their beauty and detail to the fact that they were built in the early 20th century for two expositions held in the park. Balboa Park December Nights celebrates the season with free admission to participating museums and organizations along with music, live entertainment and food from around the world during the first weekend in December. The Pacific Ocean has a cold-water upwelling off the California coast, so San Diego’s ocean temperature is chilly. In December, water temperatures can be in the low 50s, making for cold toes. Expert SCUBA divers can don dry suits and explore the kelp forests with the Diving Locker. But to enjoy the largest ocean in the world from a dry seat, San Diego Harbor Excursions and Hornblower Cruises both offer tours to view the California gray whales as they begin their migration to Baja California just as the holidays unfold. Mid-December will find San DiegoBay twinkling with lights as a merry flotilla of more than 100 boats sails by the city in the annual San Diego Bay Parade of Lights. Sip cocoa and watch the procession on the bay with San Diego Harbor Excursions or Hornblower Cruises or join them another evening for a holiday dinner aboard one of their decorated bay cruisers. But if you prefer day tripping on the bay, you can’t beat a San Diego SEALs harbor tour. You will learn more San Diego facts than most locals as you drive to the point where you splash into the 14-mile harbor, and the education will continue as you get close to marine life and wave to sailors heading out to sea. Farther inland, away from the ocean breezes, The San Diego Wild Animal Park provides vast enclosures that allow many species of animals to cohabitate with others as they would in the wild. Between Dec. 8-23 and 26-30, visitors can see lions, elephants, zebras and hippos mingle and lounge in their natural settings – after dark. The park celebrates shorter days with a Festival of Lights when more than 100,000 holiday lights illuminate the park, which stays open late for visits from Santa, holiday carolers, children’s craft activities and a snowy hill for sliding. A hot-air balloon ride is the best way to enjoy the vastness of the Pacific, the desert beauty of wild canyons and the serenity of the air. Like Santa’s reindeer, you can fly high over Del Mar to watch the sun sink into the Pacific Ocean and neighborhood decorations blink on from the basket of a colorful hot-air balloon. Southern California’s oldest and most experienced balloon company, Skysurfer offers rides that last about an hour and include in-flight champagne. Budget plenty of time to also enjoy the preflight set-up and a post-flight celebration. It is the perfect holiday gift to yourself or someone special. Join jolly crowds of people who head downtown for a more recent holiday tradition in San Diego. The Port of San Diego Big Bay Balloon Parade boasts bands, floats and as many as 30 balloons that march down Harbor Drive to culminate in a family festival on Broadway Pier prior to the college Pacific Life Holiday Bowl game at Qualcomm Stadium. This year the festivities begin at10 a.m. on Dec. 28. San Diego is a multifaceted city with something to please everyone, and in the holiday season, one secret part of its loveliness is exposed for a month or so to anyone who cares to slip southwest for a while. All over San Diego, kids watch for Santa, shoppers smile and wish happy greetings to one another, carols fill the air, and warm ocean breezes promise another lovely Christmas Day.